Who wouldn't love having a bunch of fun animals come wish them a happy birthday? Certainly, I would love it! This card was inspired by a card made by Joy Smelt, a Stampin' Up! demonstrator in South Australia. I just love these animals - they are so adorable! I colored the animals using markers and use the Darling Label stamp set and punch for the sentiment. 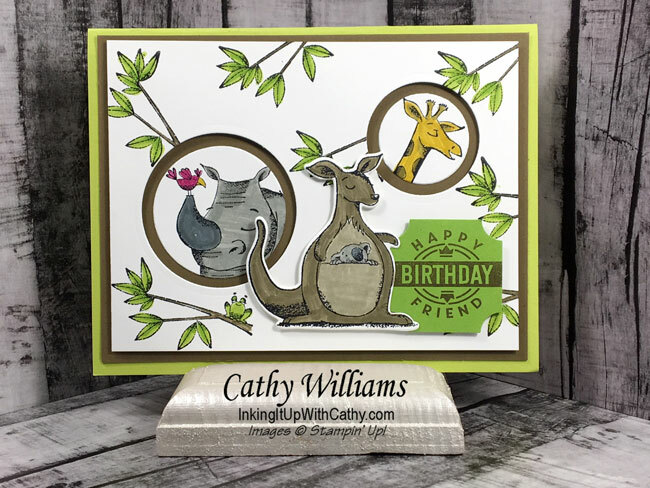 Since I did not want a bunch of the frogs (on the branch) showing up, I punched my holes for the rhino and giraffe inserts and then stamped the branches, strategically placing the frog either off the cardstock or in the center of the hole. I did keep the one little frog in the bottom left corner. 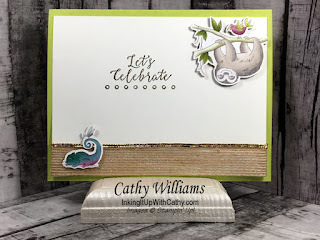 Colors used on this card are Lemon Lime Twist, Soft Suede and Whisper White. I used the Detailed with Love stamp set for the sentiment and cut the animals from the Animal Expedition Designer Series Paper using my ScanNCut.